Our foam got lost in Miami on its way here but eventually showed up. 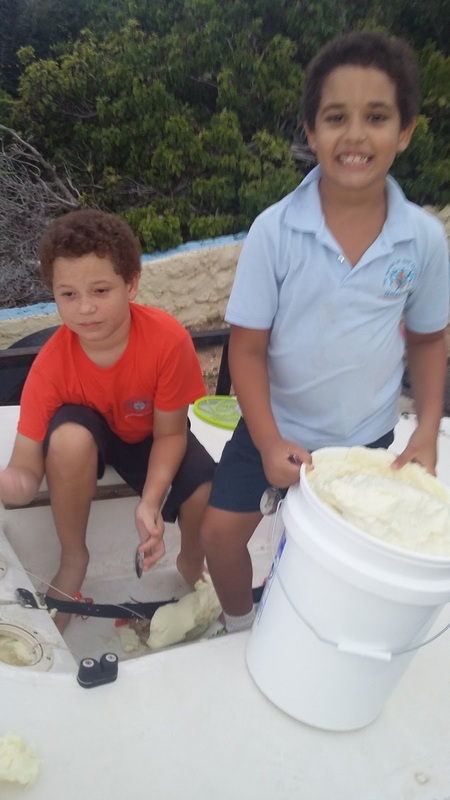 Anguilla is so warm, and we did this in the late afternoon, that the foam reacted really fast. Next attempt we will first put foam A and B parts in fridge and do it in the early morning. First attempt had maybe 1/5 gallon each of A and B. I think we got more into the boat than was left in the bucket. We tipped the trailer to try to get the first batch of foam to flow toward the back of the boat. We may stick a go-pro inside to take some pictures and see what really happened inside the boat. Anguilla is warm and this makes the foam react faster. So we put the A and B parts in the fridge overnight and did another test. It did take much longer to react but it flows so slowly that I still don't think we have much chance of getting the boat really full of foam. I am afraid that we would get pockets that once water got in would be hard to drain the water from. So now I am thinking we go on to make a real Quadmaran before attempting to send a robot across the Atlantic. So will save the rest of the foam for this. Will use this boat to test electronics and software but not too far from land. Will also try to patch holes and get a better cork.